Ladies Art Company used a very high quality of bond paper for their perforated patterns; advertising them as lasting indefinitely. At first, stamping powder or stamping wax was used to transfer the quilting designs to the quilt top. “It is best to use the powder for stamping articles to be quilted, as any part of the outline not covered by the stitches can be rubbed off with a clean cloth without marring the work.” (2) In later catalogs, Ladies’ Art Company recommended implementing tracing paper to successfully mark your quilt. Sometimes customers glued the quilting pattern directly to cardboard and then cut out along the perforated lines, using this as their quilting pattern. 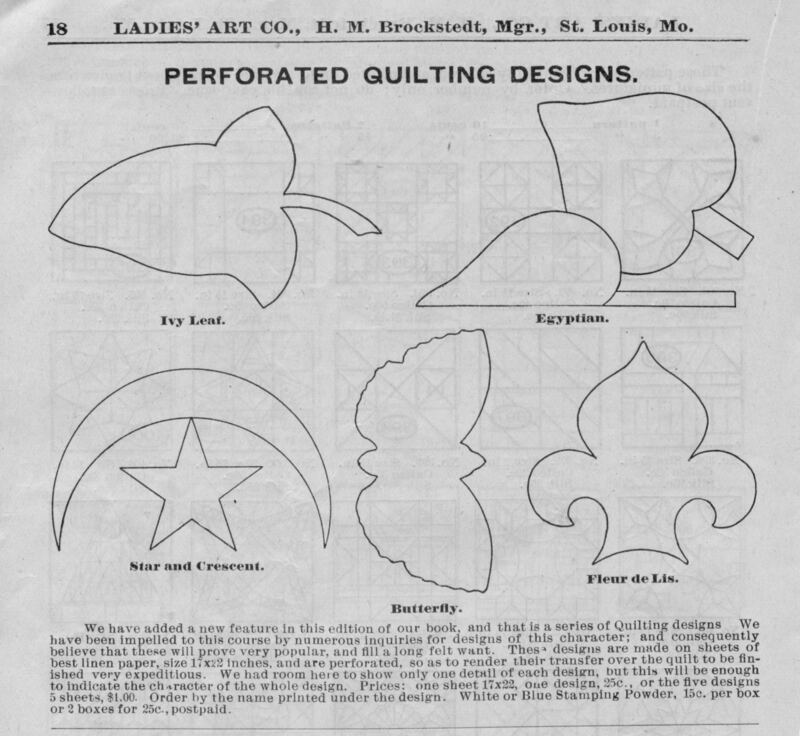 Ladies’ Art Company sold perforated quilting designs in their catalogs. As early as the Eighth Revised Edition (c. 1901) of the Diagrams of Quilt, Sofa and Pin Cushion Patterns catalog, five quilting designs were introduced on page 18. Their quilting designs were advertised for sale in magazine ads, too. Ladies Art Company sold just about every style of quilting pattern you might need, including whole cloth quilting patterns. 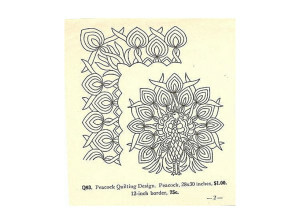 Some of the LAC quilting designs were also sold as quilt block patterns. Loose flyers advertising quilting patterns and quilt frames, were mailed with catalog orders. 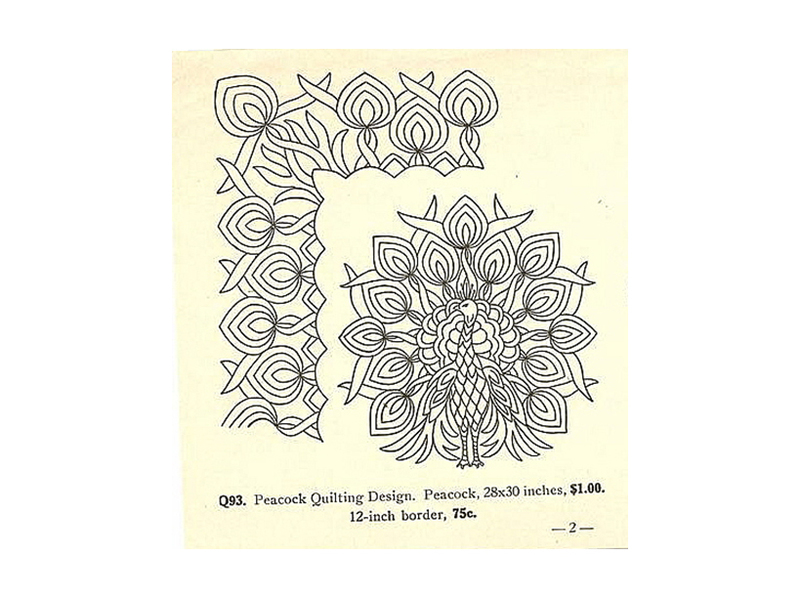 In the late 1930s, Ladies Art Company would send a free quilting design with the purchase of their catalog of stamped quilts. 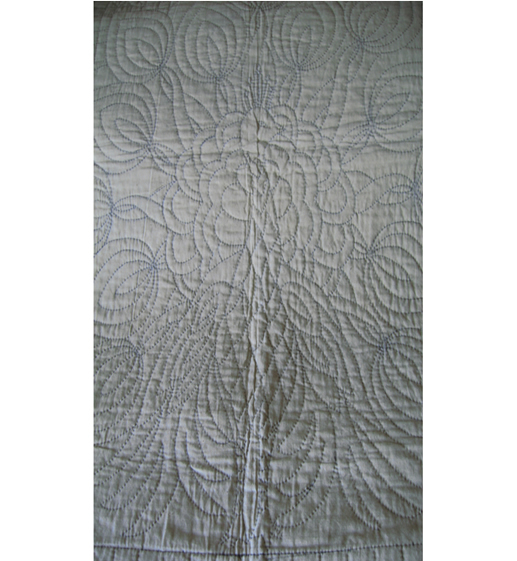 This peacock quilt and quilting design are a fine example of the pattern and the final product. Peacock Quilt Pattern, No. Q93. Both images are from the collection of Connie Chunn. (1) Webster, Marie D., QUILTS, Their Story and How to Make Them, 1915. New edition with note and bibliography by Rosalind Webster Perry. Santa Barbara, California: Practical Patchwork, 1990.